In December of 2011, Democratic National Committee chairman Debbie Wasserman Schultz accused Republicans of engaging in a " full-scale attack on the right to vote." ". . . it’s well known that Republicans have advanced strict photo ID requirements for voting in more than 30 states," the chairman of the Democratic National Committee said. "Eleven percent of Americans lack the photo identification that these new laws require—and that rate is much higher in some communities. For example, 25 percent of African Americans and 19 percent of Latinos lack a government-issued photo ID. "These are voters who consistently support the Democratic Party—and that’s exactly why Republicans are trying to use these photo ID laws to restrict their ability to vote. "Democrats refuse to stand by and watch this happen." Those are the words of Democrat leader Debbie Wasserman Schultz. Too bad her words don't represent her Party's actions. In Georgia, the Democrats recently completed their delegate selection process for the Democratic National Convention. And guess what? 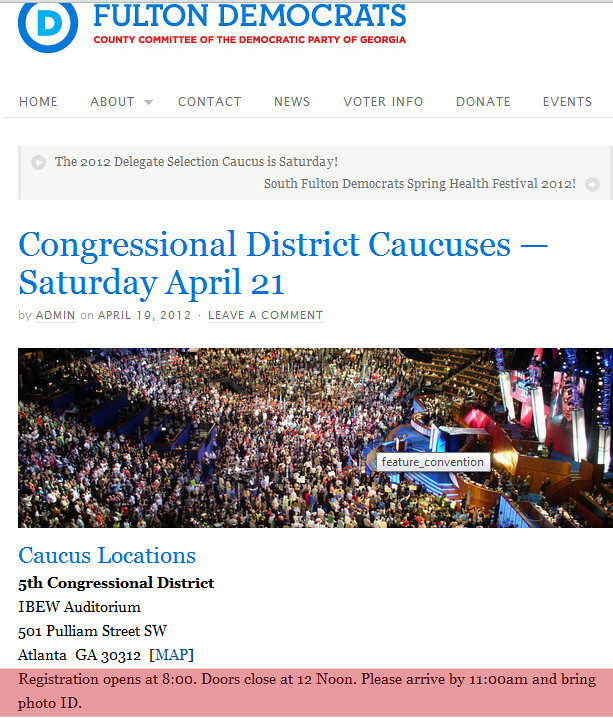 On Democrat website after Democrat website (like the one pictured right), the instructions were the same -- bring photo ID to elect Democratic National Convention delegates. But wait a minute . . . Democratic National Committee chairman Debbie Wasserman Schultz said the voters who lack photo ID are the voters who consistently support the Democratic Party; and Republicans are trying to use photo ID to restrict their ability to vote. If photo ID restricts the ability for people, who consistently support the Democratic Party, to vote, then would it not be true that photo ID restricts the ability for those same Democratic Party supporters to elect delegates to the National Convention? The Democrats would say no. The Democrats would say large turnouts were seen at delegate selection events across Georgia, and every participant produced photo ID before casting their ballots. So Democrats require photo ID at delegate selection events. Does this mean the Democrats tacitly acknowledging that photo ID adds an additional safeguard against voter fraud? Either that or Democrats oppose photo ID except when they use it themselves. Regardless, the next time a Democrat starts railing against photo ID to vote, don't let them have it both ways. Remind the Democrats that research shows their Party requires photo ID at Party-run elections.